Azure Information Protection (Azure RMS) is an enterprise information protection solution for any organization. Azure RMS provides classification, labeling, and protection of organization’s data. Note: This deployment also enables Azure B2B access for the Published Applications in Azure AD. Install and configure Azure Active Directory Connect. AAD Connect installation pretty straight forward. To use Azure RMS you have to select three extra steps in AAD Connect. Either you can modify existing configuration to the below or if you are installing from scratch then you have to select an additional features. To provide the RMS functionality to synced users, Azure RMS has been selected in AAD Connect Wizard along with the Azure AD Apps. On the AAD Connect Installation Page, click Customize to start a customized settings installation. On User Signin Page Select Federation With ADFS. Open Azure Information Protection, Click RMS Settings, Click Activate. If you are protecting SharePoint Server then you have to the additional steps on ADFS Server and SharePoint Server mentioned below. Sign in to the Azure Active Directory admin center with an account that’s a global admin for the directory. Select Azure Active Directory and then Users and groups. On the Users and groups blade, select All users, and then select New Guest user. Where userlist.csv contain userprincipal name or B2B username in first column. Further references. Download Rights Management Connector on the server where you are going to install the Connector. SVCRMS@domain.com is AAD Synced Account. Open AD users and Computers, Add SVCRMS@domain.com as a member of domain admins group. On the computer on which you want to install the RMS connector, run exe with Administrator privileges. When prompted for credential use SVCRMS@domain.com account and alphanumeric password. Note: do not install RMS connector on Exchange, File and SharePoint Server. Download and run GenConnectorConfig.ps1 the below command on SP Server. This command automate changes in registry values. On the SharePoint Central Administration Web site, in the Quick Launch, click Security. On the Security page, in the Information Policy section, click Configure information rights management. On the Information Rights Management page, in the Information Rights Management section, select Use this RMS server type https://rmsconnector.domain.com). Create classification rules and file management tasks to protect documents with RMS Encryption. Request the B2B user to access from the invitation you have sent. 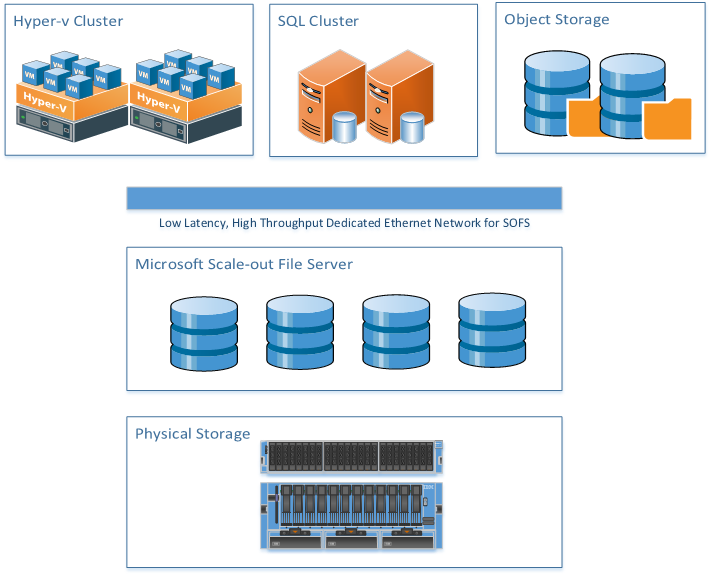 Microsoft Scale-out File Server (SOFS) is considered as a Storage Defined Storage (SDS). Microsoft SOFS is independent of hardware vendor as long as the compute and storage is certified by Microsoft Corporation. 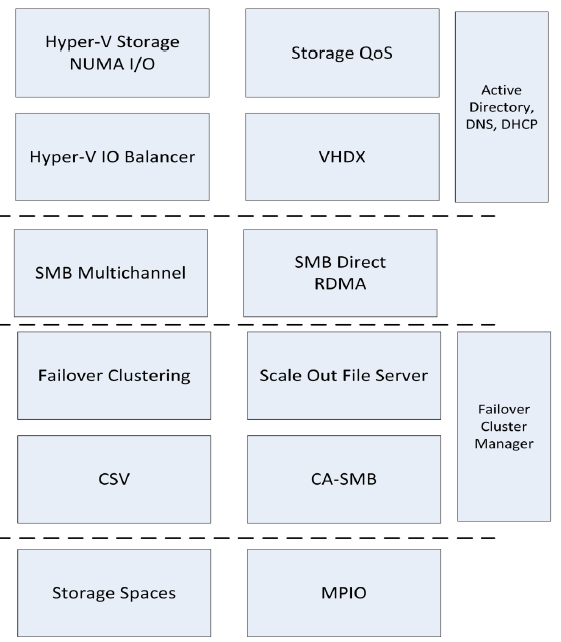 The following figure shows Microsoft Hyper-v cluster, SQL Cluster and Object Storage on the SOFS. Outperforms Single Instance Storage (SIS) or NTFS compression. 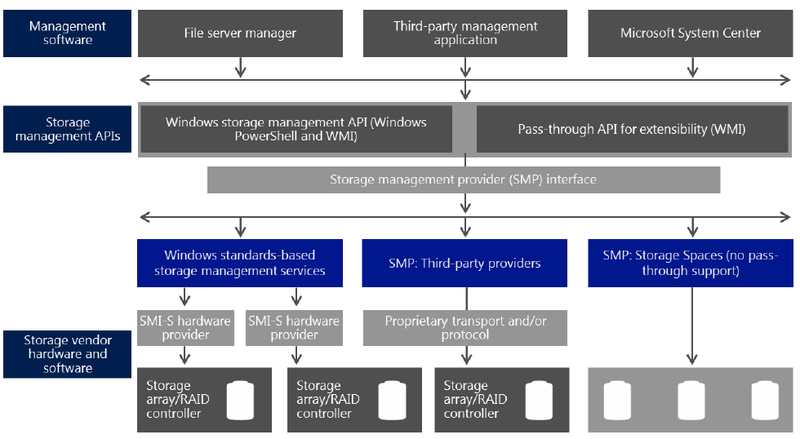 The Microsoft implementation of RDMA. The ability to direct data transfers from a storage location to an application. Provide a DR solution for planned and unplanned outages of mission critical workloads. Use SMB3 transport with proven reliability, scalability, and performance. Stretched failover clusters within metropolitan distances. Reduce downtime, and increase reliability and productivity intrinsic to Windows. *Not all virtual servers are same, DHCP server generate few IOPS, SQL server and Exchange can generate thousands of IOPS. *Do not place SQL Server on the same logical volume (LUN) with Exchange Server or Microsoft Dynamics or Backup Server. 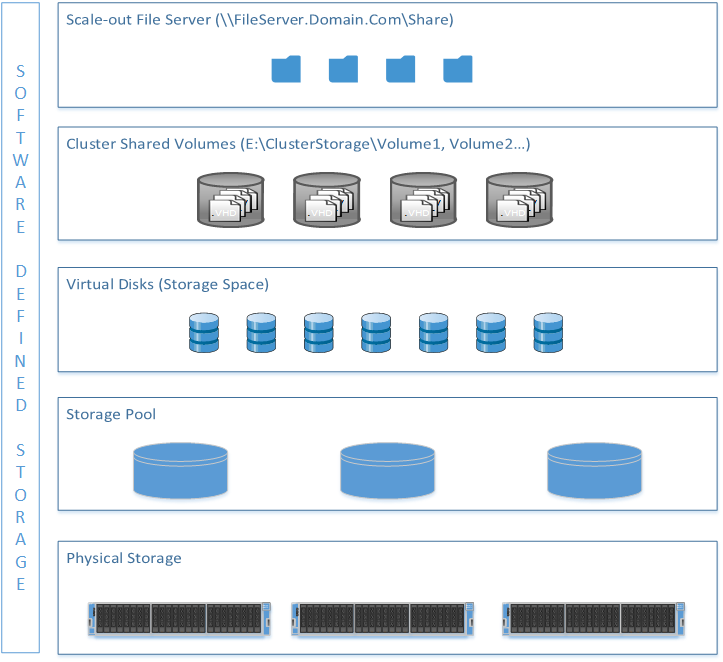 *Isolate high IO workloads to separate logical volume or even separate storage pool if possible. Log on to the server as a member of the local Administrators group. Open Server Manager> Click Tools, and then click Failover Cluster Manager. Click Storage, right-click the disk that you want to add to the cluster shared volume, and then click Add to Cluster Shared Volumes> Add Storage Presented to this cluster. Open Failover Cluster Manager> Right-click the name of the cluster, and then click Configure Role. On the Select Role page, click File Server, and then click Next. On the File Server Type page, select the Scale-Out File Server for application data option, and then click Next. On the Client Access Point page, in the Name box, type a NETBIOS of Scale-Out File Server, and then click Next. On the Confirmation page, confirm your settings, and then click Next. On the Summary page, click Finish. Open Failover Cluster Manager>Expand the cluster, and then click Roles. Right-click the file server role, and then click Add File Share. On the Select the profile for this share page, click SMB Share – Applications, and then click Next. On the Select the server and path for this share page, click the name of the cluster shared volume, and then click Next. On the Specify share name page, in the Share name box, type a name for the file share, and then click Next. On the Configure share settings page, ensure that the Continuously Available check box is selected, and then click Next. To use Scale-Out File Server file share for Hyper-V: All Hyper-V computer accounts, the SYSTEM account, cluster computer account for any Hyper-V clusters, and all Hyper-V administrators must be granted full control on the share and the file system. 8. On the Confirm selections page, click Create. On the View results page, click Close. Open Hyper-V Manager. Click Start, and then click Hyper-V Manager. Open Windows Explorer and navigate to the scale-out file share. Click the Sharing tab, click Advanced Sharing, and then click Permissions. Ensure that the SQL Server service account has full-control permissions. Click the Security tab. Ensure that the SQL Server service account has full-control permissions. 2. In SQL Server 2012, you can choose to store all database files in a scale-out file share during installation. Configure and add a dedupe storage target into DPM 2012 R2. DPM 2012 R2 will not backup SOFS itself but it will backup VHDX files stored on SOFS. Follow Deduplicate DPM storage and protection for virtual machines with SMB storage guide to backup virtual machines. Follow the Wizard. Make Sure Service Account of Veeam has full access permission to \\SOFS\Repository Share. Select the backup repository you created in previous>Follow the Wizard to complete tasks.